When Stony Brook University anthropologist James Rossie began sifting through sediment in the Tugen Hills of Kenya during his first day of the dig, he didn't know he'd discover teeth from a previously undiscovered tiny ape species. The study shows that this belongs to a new species of ape-the smallest ever yet described, weighing just under 3.5 kilograms-from 12.5 million year old sites in the Tugen Hills, giving important clues about the unexplained decline in diversity of apes during the Miocene epoch. Seven fossil teeth exposed by the Panama Canal expansion project are first evidence of a monkey on the North American continent before the Isthmus of Panama connected it to South America 3.5 million years ago. The 21 million-year-old teeth were found in the Las Cascadas Formation during a five-year intensive fossil salvage project by field crews from STRI, the University of Florida and the New Mexico Museum of Natural History and Science. Most of the mammal groups represented in the Las Cascadas formation have North American origins, despite the fact that South America is much closer, supporting the idea that Central America and western Panama represented a long peninsula extending south from North America. For millions of years, South America was an island continent. Geographically isolated from Africa as a result of plate tectonics more than 65 million years ago, this continent witnessed the evolution of many unfamiliar groups of animals and plants. From time to time, animals more familiar to us today - monkeys and rodents among others - managed to arrive to this island landmass, their remains appearing abruptly in the fossil record. Yet, the earliest phases of the evolutionary history of monkeys in South America have remained cloaked in mystery. Long thought to have managed a long transatlantic journey from Africa, evidence for this hypothesis was difficult to support without fossil data. Scientists have examined fossilized remains of a tiny, extinct monkey that were retrieved from an underwater cave in the Dominican Republic. The researchers believe the fossil to be around 3,000 years old, but say the species itself could be very ancient. This reveals clues about the origin of primates in the region. It also suggests that many ecologically valuable treasures could be discovered by the unusual field of "underwater paleontology". Researchers have discovered the skull of a 29 million-year-old animal that could be a common ancestor of Old World monkeys and apes, including humans. It indicates that apes and Old World monkeys diverged millions of years later than previously thought, say the scientists. They described the primate, Saadanius hijazensis, in the journal Nature. Dr William Sanders from the University of Michigan, who led the research, said this was "an extraordinary find". The skull of this previously unknown species had some features that are shared by Old World monkeys and apes, including humans, today. A newly discovered primate that lived in Africa some 37 million years ago is somewhat of a black sheep, evolutionarily speaking. It just doesn't seem to fit into the family tree, no matter how scientists look at it. The curiosity lies in the primate's unusual teeth, which don't match up with primate groups thought to be around at the same time. The find likely makes primate evolution on that continent more complicated, the scientists say. Recently unearthed fossils belonging to a new ape species suggest the lineages leading to humans and gorillas split several million years earlier than previously thought. Found in Ethiopia, the 10 million-year-old fossilized teeth resemble those of modern gorillas and appear specialized for eating fibrous foods such as stems and leaves. Chimpanzees in West Africa used stone tools to crack nuts 4,300 years ago. 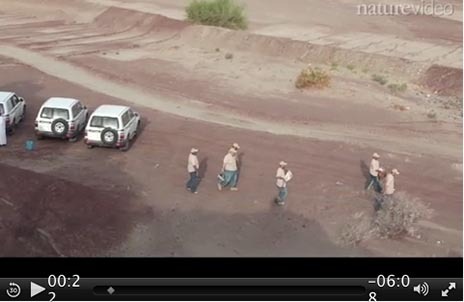 The discovery represents the oldest evidence of tool use by our closest evolutionary relative. The skill could have been inherited from a common ancestor of chimps and humans, the authors say, or learnt from humans by imitation. Alternatively, humans and chimps may have developed tool use independently, the Proceedings of the National Academy of Sciences journal reports. Chimpanzees were first observed using stone tools in the 19th century. Julio Mercader and colleagues found stone tools at the Noulo site in Ivory Coast, the only known prehistoric chimpanzee settlement. In Spain scientists have discovered 13-million-year-old fossils of new species of ape. 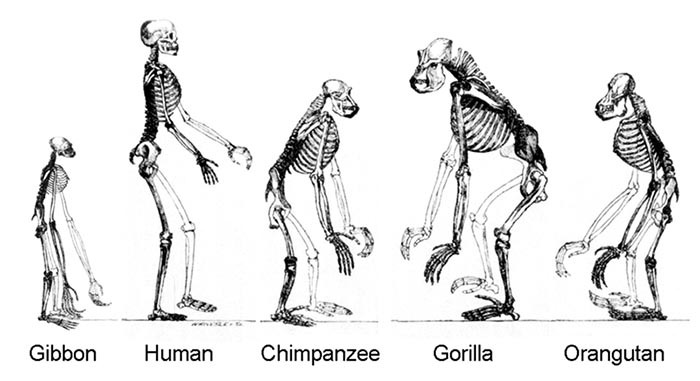 The species may have been the last common ancestor of humans and all great apes living today. The great apes which later gave rise to humans and which now include orangutans, chimpanzees, and gorillas are thought to have diverged from the lesser apes about 11 to 16 million years ago. Today's lesser apes include the gibbons. The new species was christened Pierolapithecus catalaunicus, after the village, Els Hostalets de Pierola, and region, Catalonia, where it was found. 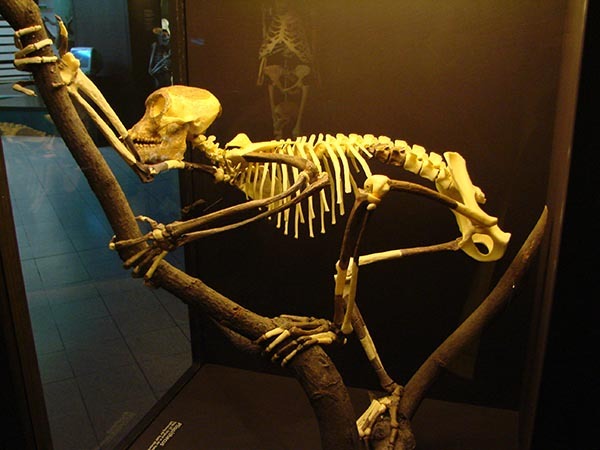 Like great apes and humans, Pierolapithecus catalaunicus, had a stiff lower spine and other special adaptations for climbing trees. The fossil skeleton's age would make it just old enough to be the last ancestor common to all modern great apes and humans, the researchers say in the November 19 issue of the journal Science. Or, if the ancestor wasn't Pierolapithecus exactly, it may have looked a lot like Pierolapithecus and been closely related.